Somatic mutation analysis of NGS reads from sequencing platforms such as the Illumina® HiSeq and MiSeq, Ion Torrent Proton® and PGM® as well as those from Roche presents a significant challenge as these variants are often found at low frequencies, many times as low as 1%. Lowering variant calling thresholds to detect these variants in lower coverage exome analyses often result in the increased reporting of false positives due to chemistry and sequencing errors. Additionally it is necessary to differentiate the somatic mutations from non-somatic variants that are also present in the sample. A new Somatic Mutation Comparison Tool has been added to the NextGENe Viewer Comparison menu in version 2.4.0, which in testing has reduced false positives by 70%. 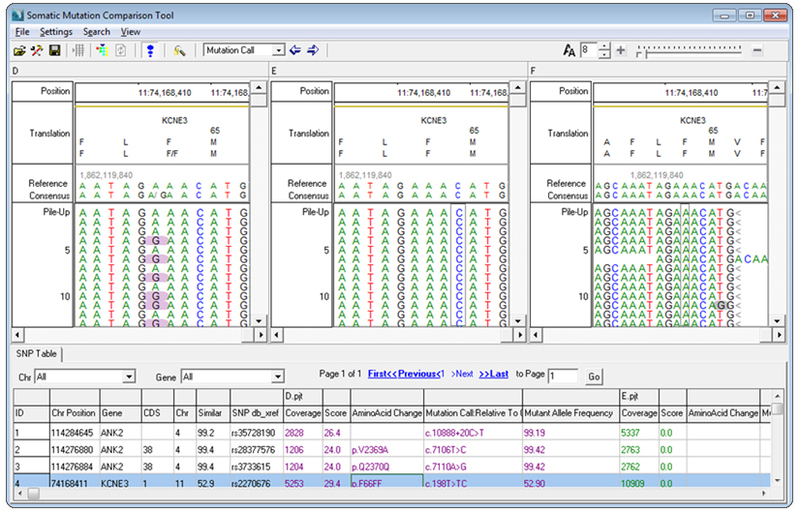 This specialized version of NextGENe software's Variant Comparison Tool allows the user to load three projects- a tumor project, a matched normal project (such as a blood sample), and a pooled project consisting of normal data from multiple sources. The tumor and normal projects are used to find somatic variants by filtering out variants that are shared in both projects. The pooled project, ideal for lower coverage exome analyses, is used to eliminate artifacts due to library preparation and alignment by filtering out variants that occur in both the tumor and pool sample. When the coverage from the liquid biopsy samples are around 10000x, as in the case of targeted PCR, the somatic comparison can be performed using only the tumor sample and normal control – no pooled project. In this case it is vital that the chemistry used to amplify the circulating tumor DNA produces reads that are directionally balanced in order to minimize false positives. In tests using 5 pooled controls the number of false positive calls has shown a reduction of up to 70%. Many of the remaining false positives were caused by common variants and systematic errors that appear in the tumor sample but were not called in the control sample due to low coverage. Increasing the coverage of the pooled normal samples will reduce the artifacts and maintain the specificity to the somatic mutation allele.